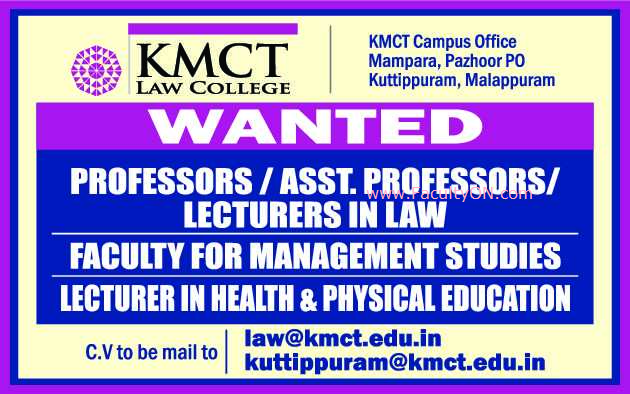 KMCT Law College, Malappuram has advertised for the recruitment of Teaching Faculty- Professor / Assistant Professor / Lecturers jobs vacancies. Interested and eligible job aspirants are requested to apply immediately from 03rd October 2018. Check out further more details below. About College: KMCT, a charitable trust in Kozhikode, conceived the idea of imparting top class education beyond pure knowledge to experimental learning and personal growth to the aspiring young generation of the country by establishing professional educational Institutions as back as in 1994 and ventured into the profession of education by starting their first institution at Kozhikode, the heart of Malabar in Kerala.